As 14th Prince Wang Jung received Hae Soo message that "She really want it". He came to meet the king seeing Jung there King was angry and scold him that he intent on dying. Prince Wang Jung was sure brave to face King Wang So. 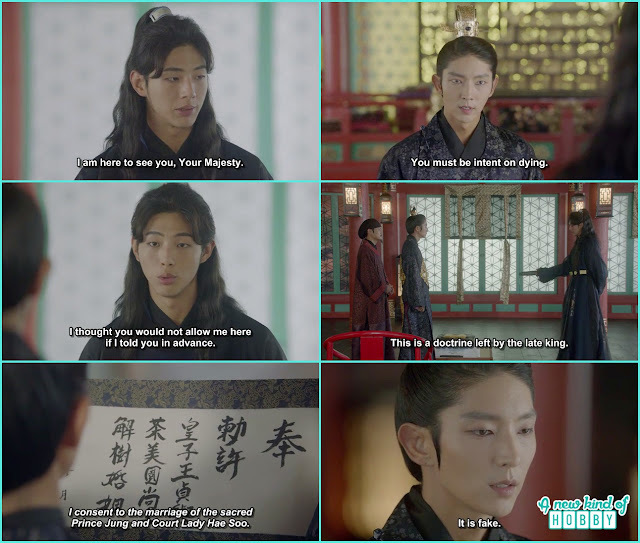 This time he prepare to take Hae Soo out of the palace and he bought the doctrine he received the late King Yoo which contain the consent to marry Court Lady Hae Soo. Seeing this doctrine King So denied and announce its fake. But 14th Prince told him its not fake but the genuine one he can match the writing with other writings of late king Yoo. Still the doctrine wasn't accepted. Then Jug didn't had any other way to remind King So that he became the king without any written doctrine yet they all believe him. 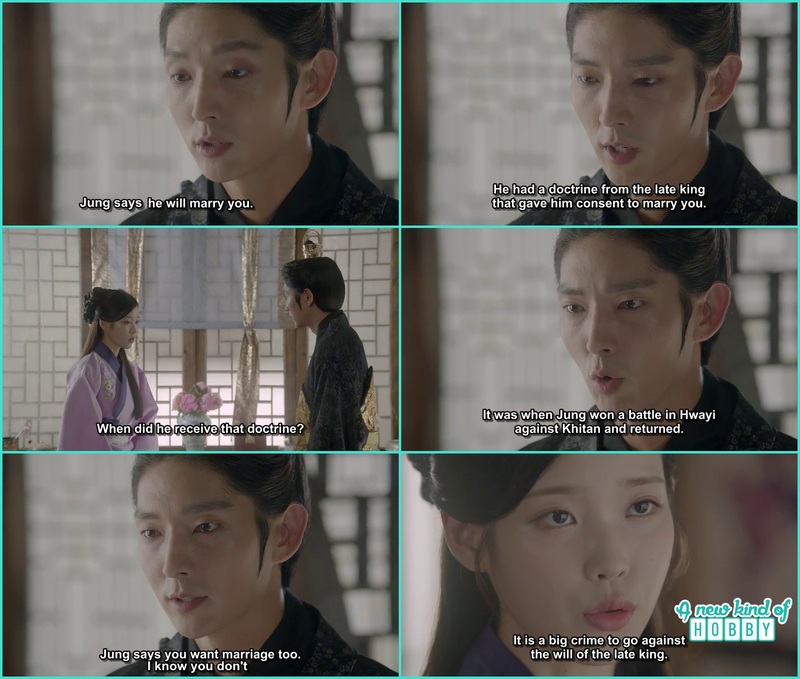 It was a big slap on King's face and he sure feel the pain so he argued that Jung can not marry Hae Soo at any cost. King bought up his personal relation with Hae Soo but still Jung was on his words and told there relation doesn't mean anything to him as Hae Soo was not his wife neither announced as the royal Concubine nor she was working at Damiwon. So there wasn't any hurdle to stop him marrying Hae Soo. Moreover he just stuck the last nail saying "Hae Soo also wants to marry him". 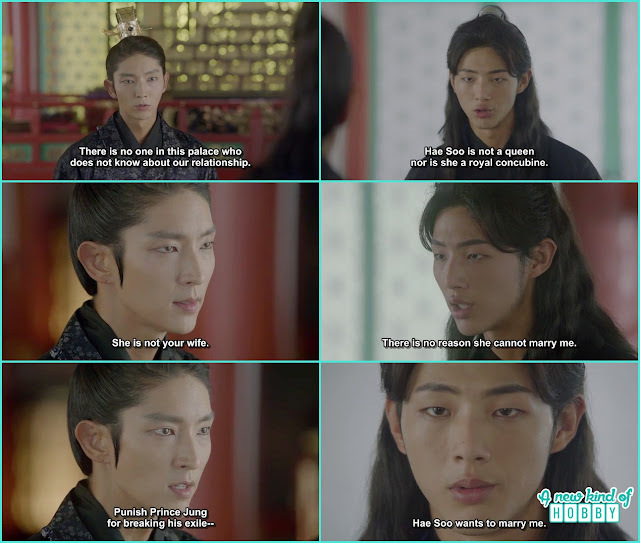 It was a shock that started King So for a moment and he forgot to announce punishment for 14th Prince Wang Jung. 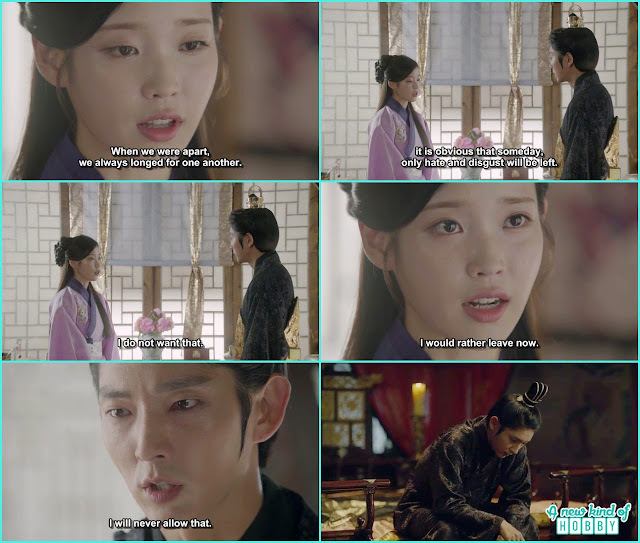 To confirm what he heard from 14th Prince King came to Hae Soo and told her about. Hae Soo after listening said if its the late king Doctrine she would have to follow it rather then ignoring it. It would be a crime against King's will. Hae Soo was way being too understanding as she don't want to put Jung in bad position because she was the pone who sent Jung the message to came her out of the palace. She knew there wouldn't be any other way so she agreed that she wanted to marry with Jung. Her confession make the king all heart broken but yet he was way being too stubborn. He refuse to give them permission and told her that he will never ever allow to it. 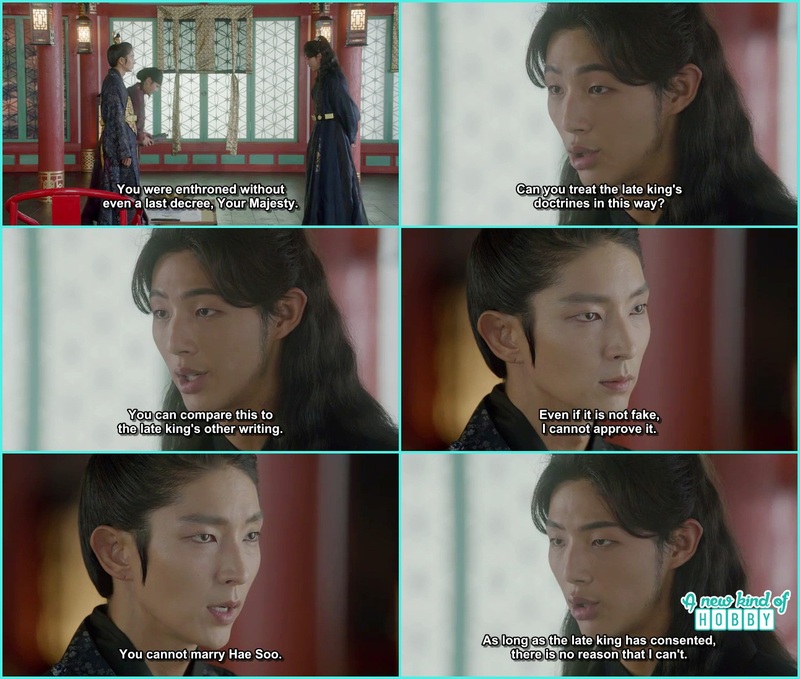 King Wang Soo tried all his best to hold on to Hae Soo but it wasn't his fate to things wouldn't be on his way either. Till here it was the last journey of court lady Hae Soo and king Wang So together and in future both will have to apart and take their separate ways to life. We feel a bit sorry for them.